The Lean management approach has been used in manufacturing, healthcare, and the technology sector for decades. These days, more and more construction firms are realizing that the Lean model has many benefits to offer in terms of project profitability, timely completion, customer satisfaction, and safety. Many firms have realized that the best way to make Lean successful is to implement software designed to support it. There are many options in the market, so it pays to do some serious due diligence before selecting a platform. While you will certainly have some questions that are specific to your firm, here are some of the most important questions to ask each vendor that you consider. Does the system make it easy for anyone to suggest an opportunity for improvement? Capturing ideas for positive change is the first step in Lean, so you want a platform that makes this easy. Because you work with a number of teams, your Lean construction software should be accessible to everyone at any time, from anywhere, and on any device. Ideally, the platform will have a mobile app that makes it possible for your front-line workers to capture an idea quickly and easily from wherever they are, with the option to include a picture or use voice-to-text recording to make it as easy as possible. How does the system ensure active improvement management? Passive systems like spreadsheets and analog boards might enable you to collect ideas, but they don't do anything to ensure that those ideas are actually implemented. They are particularly ill-suited for the construction industry with people in many disciplines and locations; you don't want a hundred hands editing a spreadsheet, but you also can't have one or two people be the bottleneck trying to keep up with managing the spreadsheets for everyone. The better alternative is a solution that has built-in alerts and notifications to ensure that everyone is aware when tasks are due, when comments have been added, and when KPIs have been updated. This helps keep managers informed about the progress of Lean work, as well as keeping the employees engaged and the improvements progressing forward. How is the impact of improvements tracked? Documenting the results of each improvement is essential to Lean construction. You want to invest in technology that calculates the impact of each improvement on specific projects and across the firm. The best improvement software platforms standardize the way everyone measures and reports their impact so that you can aggregate accurate results instantly. You should also be able to set up a system of checks and balances if needed, so that your improvement or finance teams have the ability to sign off on the validity of reported impacts. Can the interface be configured for each person? Different people are going to need different levels of access and possess varying levels of technical knowledge when it comes to your Lean construction software. Executives may need a quick, broad snapshot into the health of Lean across the organization, or insights into the progress of specific strategic initiatives, while individual employees may want to dive right into the details of a particular project or get an overview of the improvement work they're involved with. The best Lean construction software provides the ability to give everyone the exact information they need, without overwhelming them with the details they don't. Is there a searchable improvement database? The ability to search past improvement work is a simple, yet an essential requirement for Lean construction software. Your team should be able to easily search the record for past improvements and learn from past mistakes and successes. It's important that search functionality go beyond a simple keyword search. You'll need the ability to filter through the information using any criteria, and the search functionality should turn up related improvements as well as exact matches. This way, your people won't be constantly reinventing the wheel, and can instead build off the learning of one another. Can you report on engagement with Lean? One of the main advantages of implementing a sophisticated Lean construction solution is that it gives you insight into how engaged employees are. You can see how your improvement work is trending over time. The best technology helps you identify specific individuals or teams that are engaged in improvement and provide coaching to those who are not. Is there an easy way to broadcast success? Recognizing and rewarding people who contribute to positive change is important to sustaining engagement. Look for Lean construction software with built-in improvement broadcasting to make this easy even when folks are often in the field. Beyond just giving people a virtual high-five for work well-done, broadcasting improvements shares new best practices so that they can be adopted throughout the business for maximum impact. Was the software built for Lean management, or was it designed for something else? Lean software is gaining traction in a much broader set of organizations than ever before. This has caused some vendors to market project management software that was not designed with Lean in mind as improvement technology. We recommend avoiding these re-purposed tools. Folks in the construction industry know that using the right tool for the job is the only way to produce quality results. Does the vendor have clients in the construction industry who have achieved results? 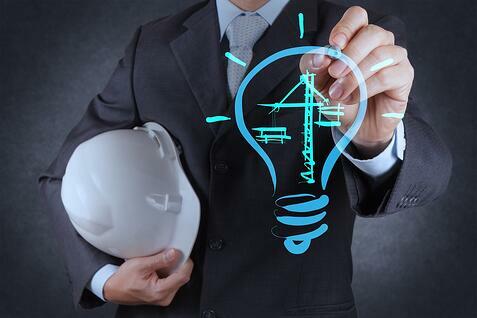 As we mentioned, the Lean approach is gaining momentum in the construction industry. It makes sense to favor vendors who have other similar clients that have been successful with the implementation of Lean software. Those platforms will understand your unique challenges and have the benefit of learning from other successful Lean construction companies, knowledge which can then be passed to you. Is the vendor a resource for Lean knowledge? Lean construction software is important, but it alone is not enough to guarantee success. A culture of Lean is the best way to get to sustained improvement over the long term. You should look for a partner that will become a resource for your team in developing that culture, rather than one posing its software as the silver bullet that will solve all of your Lean challenges. The best vendors supplement their solution with educational materials like eBooks, blogs, webinars, events, and videos. Learn about the intersection of culture and technology from JC Cannistraro, a mechanical construction firm headquartered in Watertown, Massachusetts, in this webinar. The choice to invest in Lean construction software is a good one. It will help you ensure that more improvement projects get finished. You’ll be able to tell whether Lean is taking hold across the firm. You’ll also be able to measure and broadcast the impact of Lean. Hopefully, these questions will help you complete a thorough, and effective technology evaluation.